I don't know about you, but I love fall! It is my favorite season - I love the cooler weather, the colorful leaves, pumpkins, (on porches and in pies), grasses going to seed and sending their plumes high into the air and the smell. Growing up as the leaves began their beautiful change in color it also meant that we would soon be jumping into piles of them, scattering the work of our fathers! And soon the air would be filled with the smell of burning leaves. Of course, I live in south Texas now and have for 35 years, so the first day of fall doesn't mean cooler weather and I've noticed that many of our trees don't change color until November or even December, but my memories are so great that I can still smell the fall air and picture those beautiful trees. In the excitement of fall I made this card out of some scraps that were laying on my work table. I will be doing a class next week on embossing, so I added that to my leaves and acorn and we'll probably make this or a similar card as one of our make and takes. 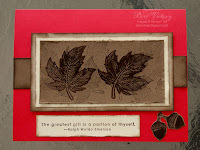 I used one of my favorite stamp sets - Autumn Splendor and Of the Earth, a recently retired Hostess set. Remember, if you want to make this card any small greeting will work nicely, if you don't have this one. Card base is Poppy Parade, a new in color for 2010-2012. The picture doesn't do this color justice! It is beautiful. I also used Kraft, Soft Suede and Very Vanilla. I came up with this color combo because the papers were on my table. I'm not sure I would have pulled them out of my paper racks and used them.together - I think I needed this random matching! I sponged the edges of all of the top pieces with Soft Suede and distressed the edges on the Crumb Cake (kraft) and the Soft Suede. 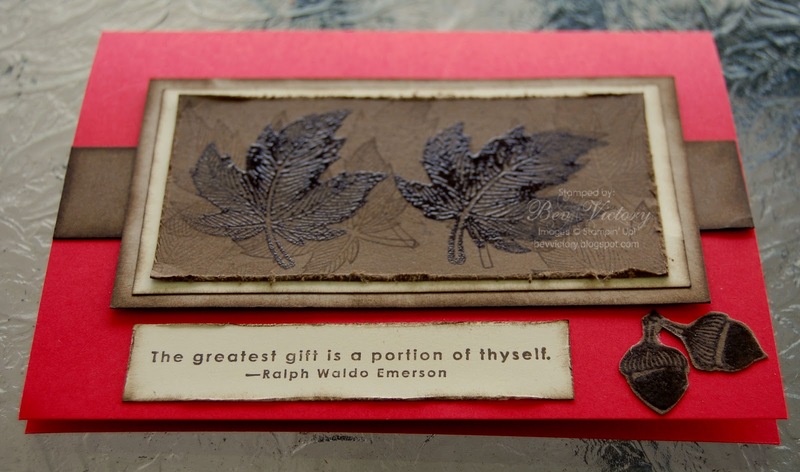 I stamped the leaf stamp as a background on the Soft Suede piece, stamping off before I stamped some of them to have the overlapping leaves in different shades. Then I stamped the leaf into the soft suede and then on my Versamark pad and stamped it on the background paper I had just made. I used clear embossing powder. I heated it and then added a little more powder. Next I went over part of the embossed area with a Versamark pen and added more powder. So some parts of the leaves would be darker and stand up more than others. I took the second shot so you can see how the embossing is different on the leaves - not just one smooth coat, but has some dimension. For the adorable acorns, I used the Versamark pad and embossed them. I then used my Versamark pen and filled in the bottom, leaving a small edge so it gave depth and embossed. I did this about three times to give it a thick embossing. I cut them out with my little snips and glued them to paper with snail. I stamped the wonderful quote, darkened the edges of the paper, again with soft suede and my sponge. I did place the layer of crumb cake on with dimensionals, but I used snail for all of the other layers. Now this card is heading to my cousin in Canada. She's probably not as excited about fall as I am, it's already dropping into the 30's there, but hopefully she will enjoy the card and warm wishes. My granddaughter just turned 19 and is in her first year at Ball State. I love to make her cards and wanted this to be a special one. As I sat and looked through ideas I had set aside, I remembered a card I had seen at regional a couple of years ago and decided that would be it. 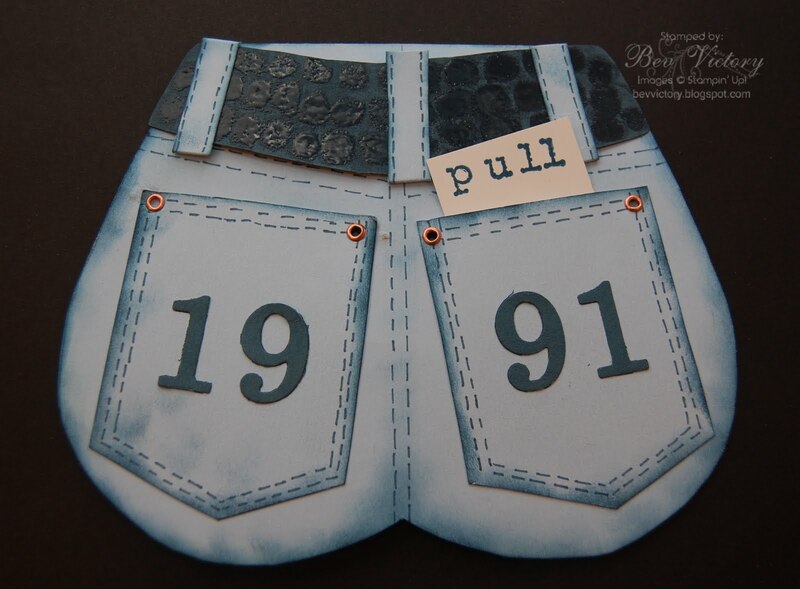 After all, what could be better than a pair of blue jean shorts and money in the pocket at her age! Just an interesting tidbit that she turned 19 and was born in 1991 - made the numbers on the pockets fun! Needless to say money was attached to the PULL card in the pocket. I wish I knew who to thank for the pattern, but I don't. This is a perfect example of CASE (copy and selectively edit) - Now it's your turn - have fun. I'm thrilled to announce that Macy Wong, my downline won a stamp set at Stampin' Up regionals in Ft. Worth last Saturday. I haven't seen all of the wonderful things she got for attending and can only imagine the amazing new ideas and techniques she'll have up her sleve now. I'm sure that she will share so watch for some pix here soon. Wow, it was February the last time I posted to this blog! Now you know it's not like me to be so quiet, but so many things have taken place in my life. As many of you know, since my last post my mom passed away 26 days shy of her 100th birthday. We held an amazing celebration back in our hometown in Missouri. We had bought a new home in December and began to move in January, but as mom became less able to move about, we put the move on hold until April after she passed. We thought we were getting a new home that would make her life easier with the bedrooms downstairs, but as she told me right before she died - God, has given you and Bill a fresh start. Mom had lived with us for 9 years and filled every spot of our home with a memory, so the move has been good, however, it hasn't stopped me from missing her. She spent Easter and her birthday with my dad, a granddaughter, her six sisters and one brother, her mom and dad and all those who had gone on before her and most exciting of all with her Lord and Savior Jesus. The void she left is huge, but she was right God has given us a new home and although there are memories of her here, we have been given a fresh start. She was the best mom ever and I miss her encouragement and love, but I know I'll be with her again some day. We are now all moved, our house in Bellaire is for sale and we are getting settled in to a whole new lifestyle. We moved about 40 miles out into the country - 2 1/2 acres (lots of mowing) and unfortunately far from most of my stamping group. On the bright side I actually moved closer to one of my first stamping buddies, Crystal, and I hope so we will have a chance to reconnect and stamp together again. 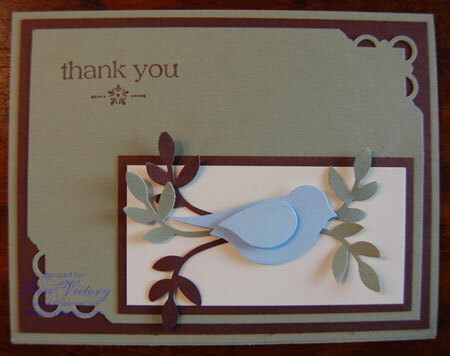 So during this time of mourning and moving my stamping was left to those times of immediacy: thank you cards, birthday cards, weddings - you know those things that must have a handmade card. Today's post includes a picture of the thank you card I sent out to those who gave flowers or gifts in mom's name. Mom was my best critic as I learned to make cards and I think she would have loved this one. I will be back soon with some of the other cards I have made during the past few months and I look forward to getting back into the groove of creating and posting. 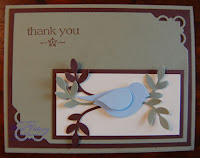 Until then happy stampin'.